Kelly Gruber attended the ribbon-cutting ceremony for the Grand Opening of Accelerated Health & Wellness Centre . Very exciting news for those of Blue Jays fans who found themselves glued to the television set back in 1992 cheering on our World Champion Blue Jays! Patrick Maddalena and Mark Georgiev, owners of Accelerated Health & Wellness Centre invite the public to stop in for their Grand Opening Open House. Many locals came by to say hi to Pat, Mark (and Kelly!) and take a tour of this new local business. The clinic is located centrally in the Fonthill Shopping Plaza next door to the Beer Store and My Place Bar & Grill. Their state of the art 3,600 sq. ft multidisciplinary clinic offers a wide range of services including Chiropractic, Physiotherapy, Laser Therapy, Smoking cessation, dizziness treatment, custom orthotics, custom bracing, acupuncture and more. Gruber played baseball at Westlake High School in Austin, Texas where his number was later retired. He was drafted by the Cleveland Indians in the 1st round (10th pick) of the 1980 amateur draft but did not see time with the team. On December 5, 1983, the Toronto Blue Jays picked him up in the Rule 5 draft. Gruber saw his first Major League action shortly after, playing in his first game on April 20, 1984. Over the next three seasons, he split time between the Majors and the minors, eventually earning an every day spot in the Toronto line-up by 1987. The Toronto media quickly nicknamed him "Xanthos" (meaning blonde) after his long flowing blonde hair. During his stay in Toronto he was voted the city's most eligible bachelor. 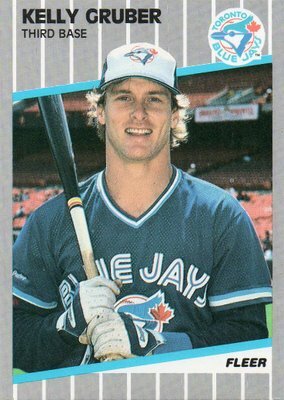 On April 16, 1989, Kelly Gruber was the first Blue Jay in history to hit for the cycle when he went 4 for 6 with 6 RBI and 4 runs scored. His cycle occurred in the following order: home run, double, triple, and single. He was told to stop at first for his single even though a double was easily attainable. Gruber had his best season in 1990, hitting .274 with 31 HRs, 118 RBIs and 14 SBs, winning Gold Glove and Silver Slugger awards and ending up fourth in MVP balloting that year. Gruber was a member of the 1992 World Series-winning Blue Jay team, and was involved in one of the most controversial plays in World Series history. In the fourth inning of Game 3, Gruber appeared to make a diving tag on Braves runner Deion Sanders' foot to record the third out of a triple play, which would have been only the second such play in World Series history. However, the second-base umpire ruled Sanders safe, despite clear photographic evidence to the contrary. Gruber tore his rotator cuff on the play; however, he hit a key game-tying home run in the eighth inning, and the Jays would go on to win the game in walk-off fashion, later taking the series in six games. Gruber was traded to the California Angels for Luis Sojo in 1993. He appeared in interviews to be very bitter about the move, feeling that he deserved better treatment from the team to whom he had been so loyal. Gruber's career was cut short in 1993 due to a bone spur on his spine. He played 63 games for the Angels. Due to growing threats of paralysis, Gruber had surgery performed on the bone spur that ended his career in 1993. The surgery was successful. In 1997, Gruber attempted a comeback with the Baltimore Orioles. While his performance was good enough to impress coaches and staff with the Orioles, Gruber decided to retire for good due to health-related concerns. Today, Kelly Gruber often makes public appearances as a motivational speaker for charitable organizations as well as holding baseball seminars throughout North America. In 1992 Gruber published his autobiography "Kelly, At Home on Third".